Practice Engineering Geology questions and answers for interviews, campus placements, online tests, aptitude tests, quizzes and competitive exams. This set of Engineering Geology Multiple Choice Questions & Answers (MCQs) focuses on “Causes of Earthquakes”. 1. Volcanic earthquakes are rarely felt outside the regions of inactive volcanoes. State true or false. Explanation: In volcanic eruptions, huge quantities of lava are thrown out suddenly under great pressure and with a big bang, causing tremors all around volcanic earthquakes, as these are called, are rarely felt outside the regions of active volcanoes. 2. Which earthquake is local in nature and rarely occurring? Explanation: The collapse earthquakes are invariably of a local nature, and rare occurrence. These are caused when a portion of ground collapses suddenly because of removal of support from below due to natural processes of rock wastage. 3. Which theory is acclaimed as a satisfactory explanation about the cause of earthquakes? Explanation: The Elastic Rebound Theory propounded originally by H.F.Reid in 1906 is, at present, widely acclaimed as a satisfactory explanation. It was proposed by him, on the basis of elaborate studies of San Francisco Earthquake of 1906 that it was related to displacement along the San Andres fault. Explanation: The rupture phase takes place along the fault and all or part the stored elastic energy is released as seismic waves and also transformed into heat or potential energy. Main shock is the characteristic of this phase. 5. Foreshocks are often recorded in which phase? Explanation: The preparatory phase is the phase in which a non-hydrostatic stress field is created in a certain region around a fault; the direction of the preparatory phase is to ultimately define the size of the actual earthquake. A number of “foreshocks” are often recorded during this phase. Explanation: The post failure adjustment is the phase during which the medium is restored to a state of equilibrium involving series of “after shocks” which are simply manifestation of release of residual strain from the rocks. 7. Earthquakes occur at which portion of plates? Explanation: Already exhaustive data has been collected to show that earthquakes occur along the boundaries of plates moving apast each other. 8. The inner regions of plates are free from tectonic earthquakes. State true or false. Explanation: The tectonism involving earthquakes is related to those boundaries, which are stressed and where stress is released by way of thrust faulting, block faulting or transcurrent faulting. The inner regions of plates are by and large free from tectonic earthquakes. Explanation: Since the plate movements at the boundaries are very slow, stresses go on building up in the rocks of the immediate neighbourhood till the limits are reached. 10. Rocks behave as ________ masses towards operating stresses. Explanation: According to the Elastic Rebound Theory, rocks are believed to behave as elastic masses towards operating stresses. When these are stressed, the rocks respond by bending as a first reaction. 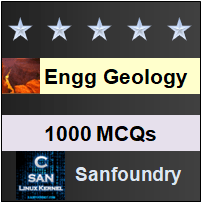 Sanfoundry Global Education & Learning Series – Engineering Geology. To practice all areas of Engineering Geology, here is complete set of 1000+ Multiple Choice Questions and Answers.